We are excited to announce that the CSI Accreditation Commission recently renewed and approved accreditation status for 110 CSI member schools in the US. Over the course of two days in July, two members of our Accreditation team and six Commission members gathered in Denver, Colorado to pour over reports from schools requesting renewal of their accreditation status and schools seeking accreditation status for the first time. During a five-year CSI accreditation cycle, schools are required to submit annual reports for review by the Commission. These reports demonstrate the school’s continued progress on specific school improvement goals. Schools going through the accreditation process for the first time are also considered for accreditation status based upon recommendations made in their school’s accreditation site visit reports. The CSI Accreditation Commission includes six volunteer members from regions around the US, who serve for six-year terms. The Commissioners give their time and energy for this important work because they demonstrate a passion for Christian education and a strong desire to see Christian education grow, remain, and be dynamic. Mary Patterson, current Commission member and the principal of the accredited Newton Christian School in Newton, Iowa, describes the CSI accreditation process as a healthy one where schools can assess their mission, effectiveness, and validity. 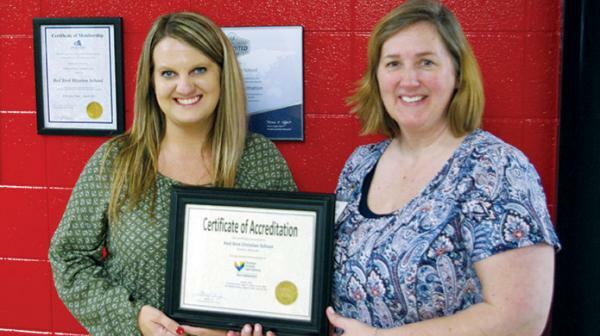 After the Commission meeting in July, Jo and her team sent communications to each school, which included their accreditation decision from the Commission, the dates of renewed accreditation or new accreditation status, and excerpts from the schools’ Commission reports. These excerpts are detailed affirmations and encouragements for each school to review as they continue to move through their accreditation cycles. Schools also receive accreditation certificates, which many schools will proudly post on their websites and walls to celebrate the continued work they do in teaching students to know God and to carry out His work. Thrilled to receive their certificate, the staff at Oaktree Academy is honored to be working at an accredited Christian school. Interested in learning more about the accreditation process? Find out more.